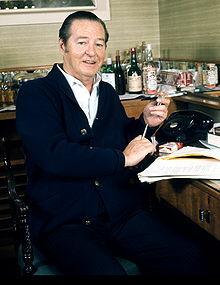 Sir Terence Mervyn Rattigan (10 June 1911 – 30 November 1977) was an English dramatist and screenwriter. His plays include French Without Tears, The Winslow Boy, The Browning Version, The Deep Blue Sea and Separate Tables, all of which have been filmed. Like other proponents of the well-made play he fell out of fashion with the coming of the Angry young men and the kitchen sink drama. Kenneth: If you’re so hot, you'd better tell me how to say she has ideas above her station. Brian: Oh, yes, I forgot. It's fairly easy, old boy. Elle a des idées au-dessus de sa gare. French Without Tears, Act I. (1937). The Deep Blue Sea, Act I. (1952). The Collected Plays of Terence Rattigan (London: Hamish Hamilton, 1953) vol. 1, p. xi. The New York Journal-American, October 29, 1956. Do you know what le vice Anglais – the English vice – really is? Not flagellation, not pederasty – whatever the French believe it to be. It's our refusal to admit to our emotions. We think they demean us, I suppose. In Praise of Love, Act II. (1973).